It's been unseasonably warm. Even I, who lives to be snuggly warm, wore a tshirt today. The daffodils are sprouting, all sorts of green stuff and buds are making an appearance. I've started reno's on the faerie houses from last year and planning some additions to the little community. The windows are open, the birds are singing. All sorts of things are waking up! This handsome fellow was found beneath one of our thyme plants. He looks rather serious. I suspect the faeries have put him on guard duty. Those first glimpses of spring and what we have to look forward to are so refreshing and delightful! True story: my internet is being really slow and it took a few seconds for that photo to load. While I was waiting, I read the caption above and was thinking to myself: "Please be a toad, please be a toad, please be a toad" and it was. You made my weekend. Thanks, knickertwist! Isn't the spring weather lovely. I have been playing in the yard myself, when I am healthy enough, and enjoying watching the world wake back up. Your toad friend does look like a guard, so serious. And seriously cute. I love toads. And yeah … I ended up stripping down to my tank top this afternoon. A first for March. Broke a sweat prepping garden beds and planting peas. Another first! Yay for spring! Check out my blog to see what I did with your little toadstool tute! You are such a wonderful source of inspiration! 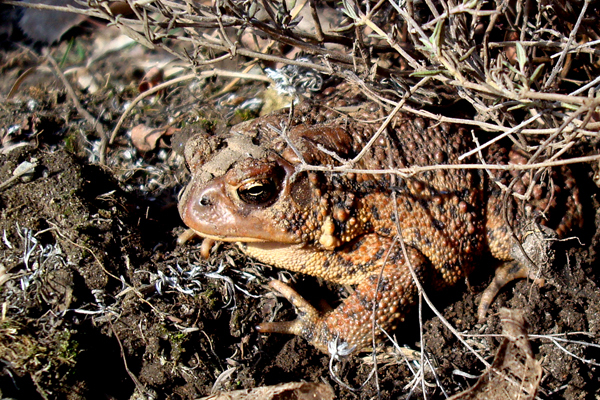 Hello, Mr. Toad! I suppose all the unseasonable racket from the birds woke him up. But there are insects out too, so he should fare okay.